During the weekend before Splatoon 2’s launch, the Japanese have finally got to see and experience the worst lines to buy a Nintendo Switch. In the past, Japanese retailer Bic Camera often conducted Nintendo Switch raffles to distribute whatever limited stock they have to customers. Customers will have to queue to get a number, wait for the winning numbers to be announced, and if they have won, they could buy a Switch. The longest lines for these raffles were said to nearly hit 1000 people at one single location. Electronics giant Yodobashi, which is said to have the best stock in the country, has recently switched to the raffle format. The line at Yodobashi Umeda this weekend easily looks like a thousand over people queuing for only 200 sets of Nintendo Switch. 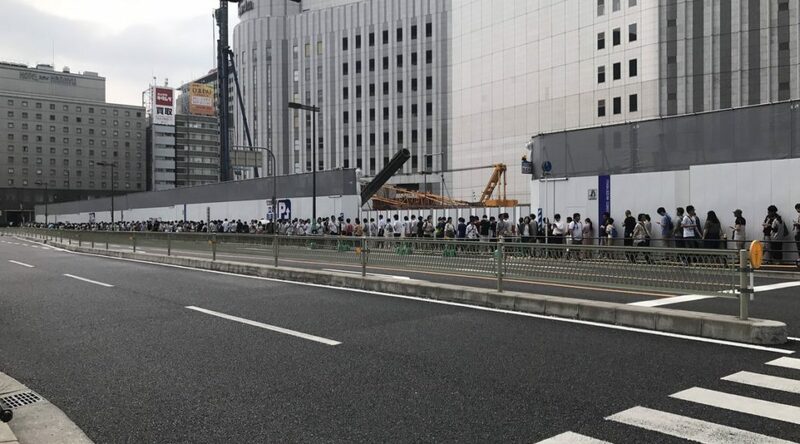 Over at Yodobashi Akiba, an estimated number of 2,600 raffle tickets have been taken at 8:27 in the morning, meaning 2,600 people were waiting in line. As the raffle ended, we got to see that the final count surpassed 3,000 people, something which hasn’t happened before. There were only 250 sets up for grabs. An act of kindness was spotted after the raffle ended at Yodobashi Akiba. A middle age man gave his winning Switch ticket to a distraught kid who didn’t get a chance of buying a Nintendo Switch. As you could imagine, that boy’s face instantly brighten up. I’m so happy to see there are still many good people around!